A disease prevalence survey in Uganda’s Masaka, Mukono and Kamuli districts was recently undertaken by a team of ILRI researchers and postgraduate students from Makerere University. 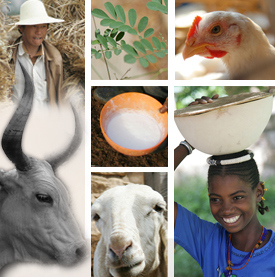 Led by Michel Dione, a post-doctoral fellow with the Smallholder Pig Value Chains Development (SPVCD) project, the activity contributes to the joint efforts of the SPVCD and Safe Food Fair Food (SFFF) projects. Blood, serum and faecal samples were collected from each of the 1273 adult pigs sampled from households in the three districts. In many cases, when animals showed infestation with ectoparasites, samples of those were also collected. 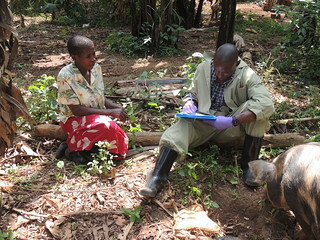 In each of the farms where samples were taken, a household questionnaire covering aspects of pig housing types, husbandry practices, human nutrition and general farm management was administered. Tags: data collection, food safety, piggery, pork, risk assessment, zoonotic diseases. Bookmark the permalink.